Halloween may be over, but that doesn’t mean that you have to forget all about skeleton costumes, carved pumpkins, and spooky treats thanks to BitStarz and Fortune Jack Casino. Both operators recently launched new promotions to commemorate Halloween and give their members something extra to look forward to once the holiday passed. Individual prizes of up to €50,000, free spins bonuses, and free trips to Bali can all be claimed by those who dare to join these spooky new promotions. Individual Prizes of up to €50K and a Deluxe Holiday for Two! As is the tradition, BitStarz is kicking off this month with a new adventure-themed promotion. This one is called the Horror Trail and it features four different islands full of graves, pumpkins, and iconic horror characters like the Headless Horseman and Jason from the Friday the 13th movie. The tournament began officially on October 29th and it will last until November 22nd, after which the main prize winner will be announced. As the rules go, each time you place a real money wager on a casino game your progression bar will start filling. As you fill up a bar, you can progress to a new position on the map, coming closer to the main prize of the competition. There are 40 levels in total to be reached and each time you get to a new level BitStarz will automatically credit a prize to your account. 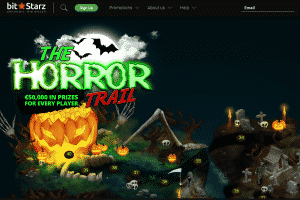 Any player can get up to €50,000 worth of prizes in the Horror Trail, given either as money prizes, free spins, or other rewards. And if you get to the final position first, you can also win yourself a luxury trip to Bali for two. The Bali package consists of 2 flight tickets for you and your partner/friend plus a 6-nights all-inclusive stay at the Four Seasons Villa Deluxe in Bali. In fact, the only thing you have to worry about is obtaining a visa for the island, which will be at your own expense. If you want to learn more about the main prize or any other rules about the Horror Trail, you can simply go and take a look at the promotion at BitStarz Casino. Not one to be outshined, Fortune Jack Casino also launched a new Halloween-themed promotion that will remain open for an unspecific period of time. Named Only Treats, this new promo offer at the casino gives all registered punters a chance to take a 100% matching bonus of up to 500 mBTC plus a total of 100 free spins. To get your bonus, just go to your account menu and find the bonus page where you can activate the special offer. In order to unlock the bonus, you have to deposit a minimum of 0.002 BTC while the free spins can only be unlocked if you deposit 0.02 BTC and wager your deposit amount 1x. The spins are given 25 a day for 4 consecutive days and they need to be spent within 24 hours after receiving. If you are interested in this special Halloween treat, just go to Fortune Jack Casino to claim your prize!